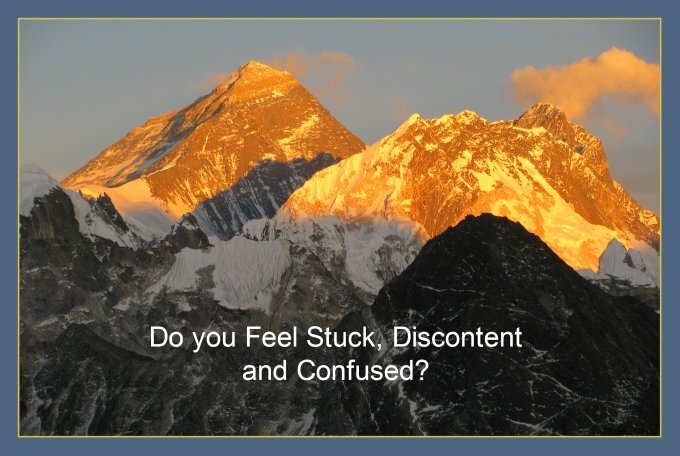 Do you Feel Stuck, Discontent and Confused? You probably googled: being stuck, discontent and confused ……welcome to my blog, I hope this post will lift your confusion, or at least help you accept the times when you feel confused. Most people have these moments of feeling stuck, confused and discontent, I sure have many times. Confusion is constantly with me, but I am learning to not be stopped by it. Last year my coach introduced me to “Human Design” and used it in our coaching sessions. One of my obstacles came up: “confusion” and I learned that it actually is a huge energy in my system and I should use it as an asset. I used to see it as a hindrance and after hearing what he told me… I thought, now I’m totally stuck with it. Nothing will get done, because my confusion always takes me out of the game. Painful…… can you relate? The pattern acts like this: I am “gungho” about a project and start doing things then……I get confused and I start questioning everything I do…. with the result of not wanting to move forward anymore. How can you make this work? First I thought, wow this is brilliant and it is… but of course it takes a bit of time to get out of one pattern and get into the habit of doing something new. New habits need to be practiced and after a while they become second nature, experts say it takes 21 days…This is very hopeful, but to be honest… I would say it takes longer. Adopt the new attitude that there is no rush, it’s just life and there is nowhere to get to, no time limit to do it within. This is such a great help, that there is time and no rush. it's normal to set time lines, but we don’t have to. Ok… sometimes it’s necessary but not always. These are common suggestions and tools, most people think it’s too simple and they don’t believe they work, they don’t want to do stupid exercises like this. The big answer to the problem is: don’t let your mind talk you out of stuff because…….. Your mind is the big problem. Your mind is not here to make you happy, help you be successful and all the other good stuff. Your mind is here to keep you safe. Do you understand this? Just to spell it out what safe means for the mind: a miserable, boring, unfulfilled life. What this reminder phrase looks like for me: "Confusion is just an energy to help me help others clarify their life". This is what it says in my human design chart: I am under pressure to make sense of certain aspects of the world and to bring rhythm and change into other people’s lives. I am here to make others aware of aspects of their lives so they can follow a progression of change or choose to stay the way you are. But whether you chose to change or not …….the awareness my energy brings, cannot be ignored. If you are curious, try an exploratory session with me, it’s my gift to you: e mail me at maritasteffe@gmail.com to schedule a convenient time for you. Author MaritaPosted on September 29, 2015 September 29, 2015 Categories Empowerment, Inspiring storiesTags create reminders, do you feel stuck, healthy habit, how coaching helps, human design, lift confusion, new attitude, new habitsLeave a comment on Do you Feel Stuck, Discontent and Confused?